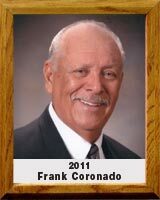 Frank Coronado played baseball at Tucson High School, graduating in 1958, and for many years was instrumental in organizing, coaching and managing baseball teams in Little League, Pony League, American Legion, high school, city league and semi-pro leagues. He remains active in senior softball play, serving as a coach, manager and player and has held various board positions helping the organization prosper. In 1972, Coronado was part of the Tucson Gas & Electric semi-pro baseball team that placed seventh in the national tournament in Wichita, Kansas, and received the NBC Sportsmanship Award. That team was named Team of the Year by the Arizona Daily Star. Coronado helped many teams win state, district and league championships. He has served on several baseball and softball committees and has operated the Cinco de Mayo Senior Softball Tournament in Nogales, Arizona that benefits youth programs in Pima and Santa Cruz counties and in Nogales, Sonora.